Welcome to the second in a periodic series of posts on my list of “canonical” superhero stories. (The original post, which includes a link to Tucker Stone’s call for such a canon, is here.) Last time I talked largely about “Beware My Power,” the introduction of Green Lantern John Stewart from writer Denny O’Neil and penciller Neal Adams. 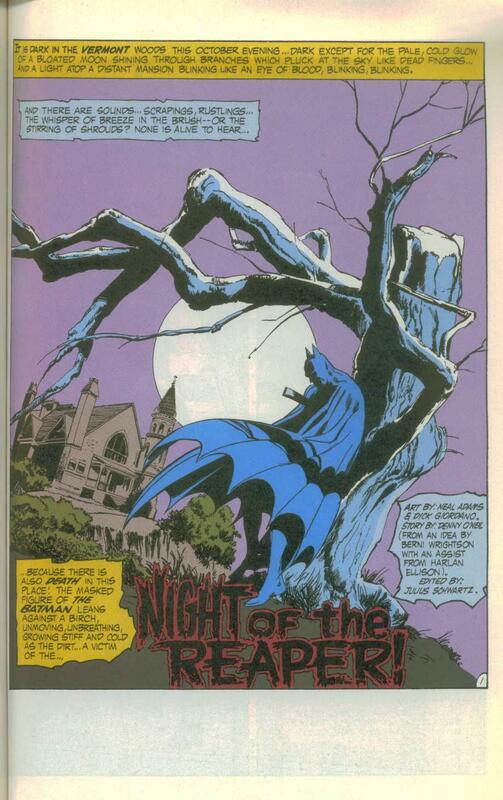 This week brings another O’Neil/Adams tale, “Night of the Reaper!” from December 1971′s Batman #237. Now, I don’t want you to get the wrong idea — my standards certainly don’t begin and end with O’Neil and Adams. In fact, timing has placed “Reaper” at this particular point on the schedule. Not only does it take place at Halloween, but it strikes me as a fine way to remember the late Tom Fagan of Rutland, Vermont. As the man behind Rutland’s Halloween parade, Mr. Fagan helped inspire this story, as well as a few others. “Night of the Reaper” uses Rutland’s Halloween festivities as its backdrop, and really, it’s all about the costumes. Just about everyone is in some kind of weird getup; and the reader is invited to imagine that all those strange adults in their bizarre outfits (we see no minors trick-or-treating) might just be the real thing, be they Batman, Robin, or Death itself. While the murders the story chronicles have some very down-to-earth motives, they too have been “dressed up” for Halloween. Thus, “Night of the Reaper” is an excellent superhero story because it melds the empowerment of a superhero costume with the unique atmosphere of Halloween, and draws on both for an eerie, fantastic mood.